I live in Italy, but MacStories' audience is primarily US-based, which has posed a few interesting problems over the years. One of them1 has been the constant conversion between currencies: I get paid in US Dollars, but I need to convert to Euros for my bank account; or, I often need to purchase products sold in USD, and I have to find the equivalent in my currency. 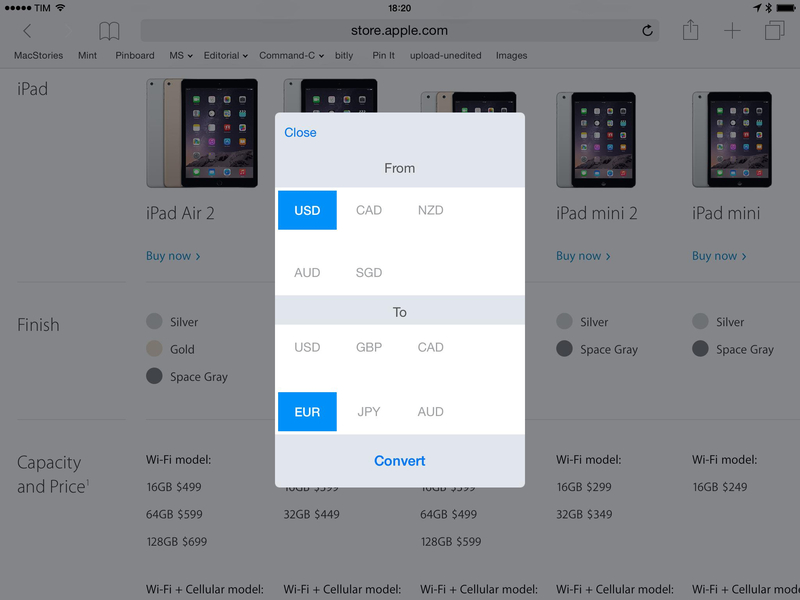 I've now learned how to calculate currency conversions quickly by myself, and, obviously, I've tried a number of currency converters on the App Store. Lately, I switched to PCalc as my go-to calculator and currency/unit converter thanks to its custom keys. 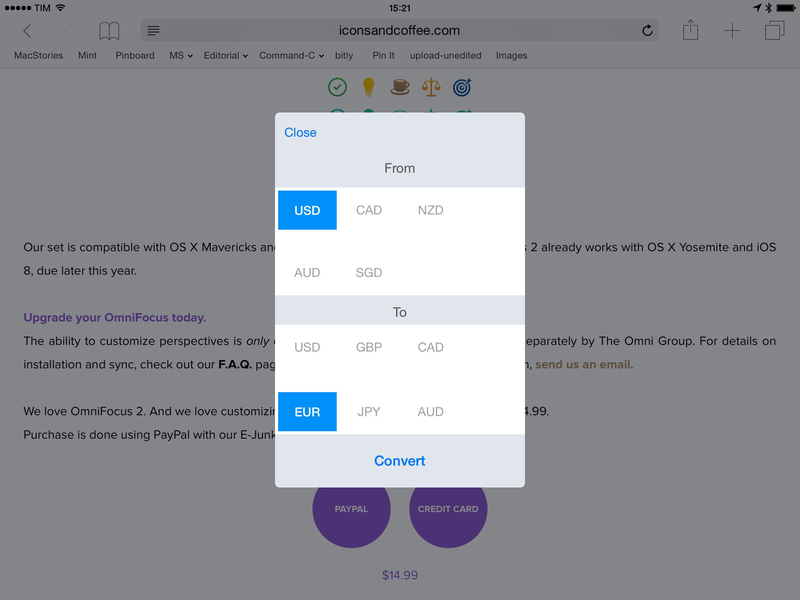 Stacks 2.0, developed by WapleStuff (the same creators of Calzy), takes advantage of iOS 8's new Extensibility features to provide one of the most unique and convenient ways to convert currencies I've ever tried. 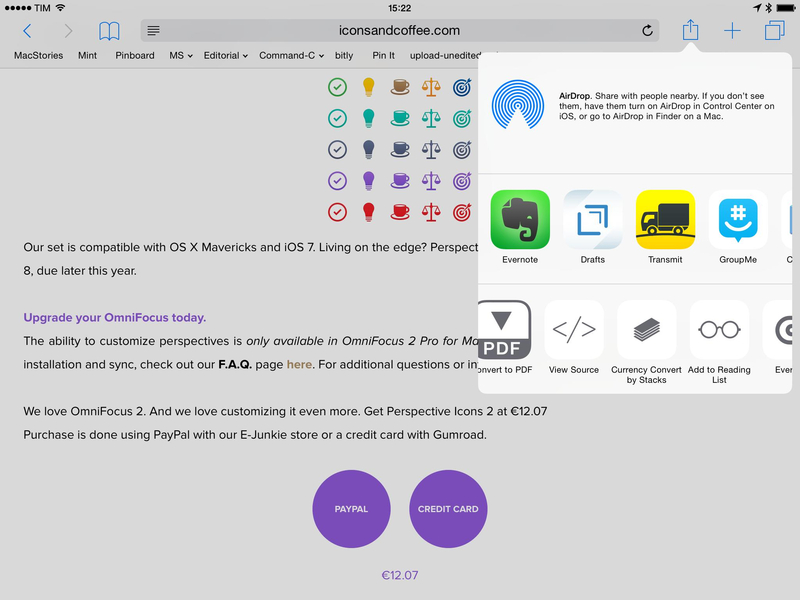 Stacks 2.0 integrates with Safari, using an action extension to convert currencies directly in a webpage you're looking at. As an app, Stacks 2.0 is a polished currency converter that, however, offers more or less the same features of other similar apps: it's Universal, its design is minimal, and there are two widgets to convert currencies in Notification Center or display a list of denominations. Thanks to PCalc, I've realized that I don't really need a full-blown currency converter on my Home screen – I can create a couple of custom buttons for my most used conversions, and let Google do the rest for me when I need other conversions. I like that Stacks shows historical data for currency exchanges, though – especially because it means I don't have to look up that data on a mobile-unfriendly financial website. Safari is a different story. I look at expenses in my web browser every day: receipts from my server company, Rackspace Cloud Files, stuff I want to buy on Amazon, the iTunes affiliate website – whether it's for work or pleasure, I look at amounts of money in Safari on a daily basis, and most of them require a currency conversion between US Dollars and Euros. Normally, I'd have to copy the amount in Safari, switch to my currency converter of choice and paste it, or I'd have to remember the number, type it, and perform my conversion. Stacks eliminates the need to switch from Safari to a dedicated app – such as its own host app – because it can convert currencies inside the webpage you're looking at with the tap of a button. Whenever you're looking at a webpage that contains amounts of money you want to convert, bring up the system share sheet, pick currencies from the Stacks popup, tap Convert, and Stacks will, for instance, turn Dollars displayed in a webpage into Euros. A webpage in Safari before running the Stacks extension (pictured). 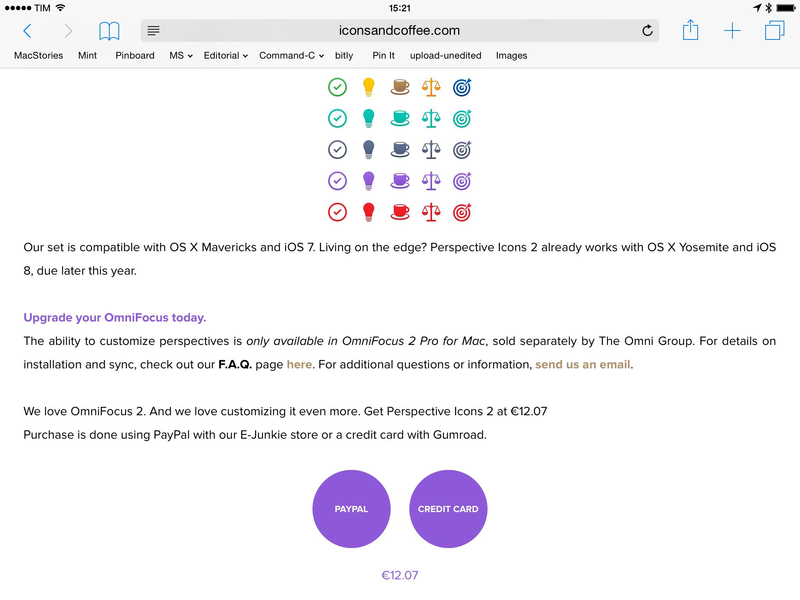 A webpage in Safari after using the Stacks extension (price converted from USD to EUR). There's a certain magic to Stacks the first time you see its extension in action (no pun intended), and that's entirely possible thanks to the new technologies available to developers in iOS 8. Safari action extensions get access to the full DOM of a webpage, which allows apps like Stacks, Pinterest, or View Source to access the entire contents of a webpage and even modify them. I've been using Stacks to quickly convert payments I'm always managing in Safari, and, in the majority of my tests, the app and extension performed admirably, leaving a smile on my face because this is now possible on iOS (watch the video above to get an idea). Like many other apps that have come out in the past two months, Stacks shows what developers can do with iOS 8. It's a novel take on an existing concept, well executed on iOS 8 – and it's useful. Stacks 2.0 is available at $2.99 on the App Store.